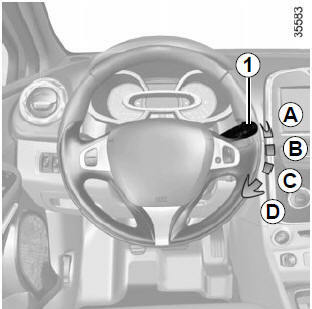 Positions B, C and D are accessible with the ignition on. When driving, the wiping speed slows down whenever the vehicle stops. The speed will change from fast wiping speed to normal wiping speed. As soon as the vehicle moves off, wiping will return to the speed originally selected. If stalk 1 is operated, it overrides and cancels the automatic function. 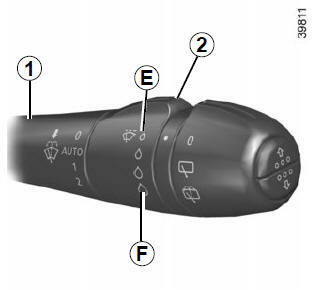 F: maximum sensitivity NB: in foggy weather or during snowfalls, the wiping is not automatically triggered and remains under the driver’s control. 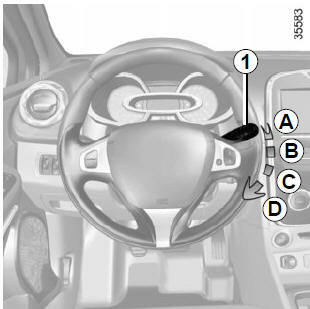 Position C is accessible with the ignition on. Positions B and D are accessible only with the engine running. With the ignition on, pull stalk 1 towards you. In freezing or snowy weather, ensure they are not stuck to the windscreen (including the central area located behind the interior rear-view mirror) and the rear screen before starting the wipers (risk of motor overheating). free them from the windscreen or rear screen when they have not been used for a long time. In all cases, replace them as soon as they begin to lose efficiency: approximately once a year. Before using the rear wiper, check that no object obstructs the travel of the blade. Do not use the wiper arm to open or close the tailgate.